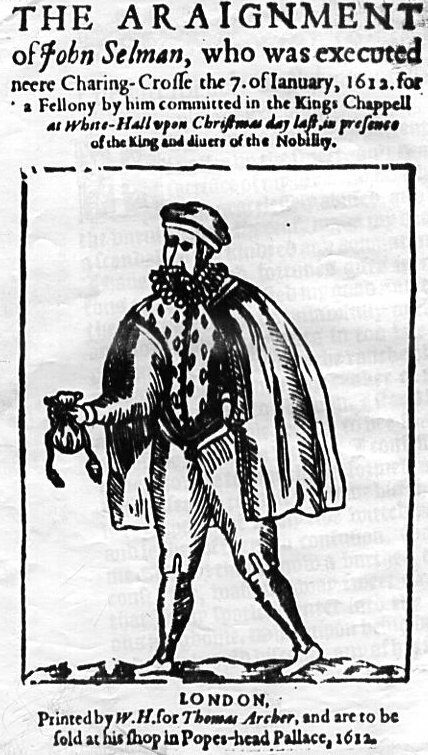 400th death-day congratulations go to John Selman, a brass-balled nimblefingers who was hanged on this date in 1612 for stealing … at Whitehall … on Christmas … in the presence of the king. And, Selman himself added in his scaffold confessional, “in the time of divine Service, and the celebration of the Sacred Communion.” That’s like hitting for Stuart England’s malefaction cycle. This common thief had tried to blend among the ermine-clad set at church with a black-velvet cloak getup, but drawn enough suspicion to be nabbed with a 40-shilling purse he’d brazenly boosted from a nobleman‘s retainer. Francis Bacon, one of Selman’s judges, affected a suitably hyperbolic indignation at the effrontery of it all: “The first and greatest sinne that ever was committed was done in Heaven. 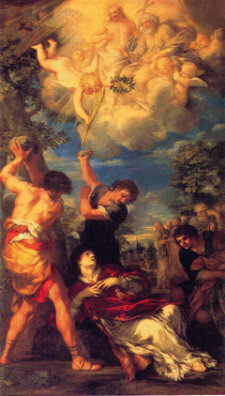 The second was done in Paadise, being Heaven upon Earth, and truly I cannot chuse but place this in the third ranke.” Tens of thousands of human beings in the judge’s immediate ambit — England, Europe — had been slaughtering one another to the glory of God for the past century when Bacon said that. He’d surely give Nancy Grace a run for her money. Then as now crime moved copy, and if the realm’s lord magistrates were ready to measure this guy up against Beelzebub, one can readily imagine the woodblock tweets he sent a-flying among the hoi polloi. Selman’s audacious escapade relieved his last days’ dread with the gift of celebrity. Writers scrambled to churn out Selman-tinged copy, like these inevitable ballads. Now was my mischiefe ripe. And now the God in secret knew it. did make it open knowne. Hopefully God got a cut of the action from these writers. Talk about a Christmas gift for a scribe. Selman’s 15 minutes apparently took years to run, because Jonson went back to the same inspiration for 1614’s Bartholomew Fair — perhaps basing the character of Ezekiel Edgworth on Selman. At Court, and in Christmas, before the Kings face. That only belongs to the cunning Cut-purse? Than live to be hang’d for cutting as purse.